Some gardens, however small, are created to serve a larger social purpose. Victory gardens (originally called war gardens or liberty gardens) made their first appearance during World War I (1914–1918). President Woodrow Wilson called on Americans to plant vegetable gardens to ward off the possible threat of food shortages. Americans took up the challenge as a civic and patriotic duty. Catchy slogans like “Food Will Win the War” appeared in numerous ads and posters aimed at encouraging the American public to do their part for the war effort. During World War I (1914-1918) and World War II (1941-1945), millions of Americans helped the war effort by turning front yards, backyards, schoolyards, and vacant lots into vegetable gardens. These home front projects allowed every American to dig in to win. America became the world’s leading seed supplier during World War I, as Europe faced mounting seed shortages. Calling attention to the war garden movement, seed companies and nurseries embellished their catalogs with patriotic imagery. Charles Lathrop Pack, head of the National War Garden Commission, coined the term “victory garden” as World War I was nearing its end. More upbeat than “war garden,” the term was so popular that it was used again during World War II, when victory gardeners sprang into action once more. In 1943, with World War II underway, First Lady Eleanor Roosevelt had a victory garden planted on the front lawn of the White House—just one of the millions of victory gardens planted that year. Staged photographs in seed catalogs and instructional manuals often showed women and children tending victory gardens. The message: abundant yields were possible for any aspiring gardener. Books, newspapers, and magazines suggested that home gardeners with limited space might plant vegetables in existing flower beds. Gardens for Victory proposed tucking asparagus, rhubarb, and Jerusalem artichoke in among the perennials, while root vegetables could take the place of flowering bulbs. Beginner victory gardeners were encouraged to plant vegetables that took up little space in their gardens, such as tomatoes, carrots, lettuce, and cabbage. Soybeans, billed as “wonder beans” or “miracle beans,” required little room and served as a protein substitute when meat was rationed. During World War II, every family in America was issued ration books to ensure fair distribution of foods in short supply. The books contained stamps for rationed goods like sugar, meat, cooking oil, and canned foods. Victory gardens helped to supplement these items with fresh vegetables. Home canning reached its peak during World War II. Most families had a pressure cooker, which raised temperatures in fruits and vegetables high enough to kill off any bacteria before the food was “canned” in sterile glass jars. Women’s Land Army (WLA) members participated in both urban victory gardening and rural farm labor, filling in for the 3 million farmworkers who had gone to war or industry since 1940. Many had never harvested crops before. By May 1943, victory gardens supplied 40 percent of the produce in America. Even superheroes pitched in! Batman, Robin, and Superman tackle a victory garden. Today, the Smithsonian’s Victory Garden flourishes on the 12th Street side of the National Museum of American History. In the summer, the garden showcases heirloom varieties of flowers and vegetables that were available to gardeners during World War II. The school gardening movement arose during the Progressive Era (1890–1920), a time of passionate calls for political reform and social betterment. Gardens were seen as a way to get city children out of crowded and unhealthy tenements, to teach them to appreciate nature, and to instill a sense of civic responsibility. From the Progressive Era of the early 20th century, to the urban community gardening movement of the 1970s and ’80s, many schools have used gardening as a teaching tool. Americans keep finding new reasons for getting city kids into the garden. In 1902, reformer Frances Griscom Parsons created the DeWitt Clinton Farm School in New York City, one of the first gardening programs for children in America. Located in a gritty neighborhood known as Hell’s Kitchen, individual garden plots were provided for neighborhood children of recent immigrants to grow vegetables. School gardens were intended to reconnect urban American youth with nature, impart good moral character, and teach children to be producers as well as consumers. 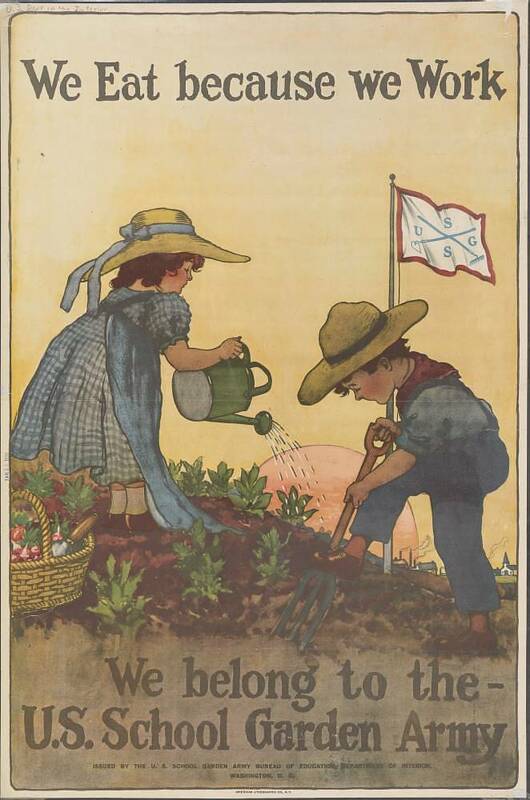 Numerous school gardening books appeared during the Progressive Era. Teaching children to garden, educators claimed, instilled such civic virtues as caring for public property, the importance of work, and love of nature. The Burpee seed company offered special packets of seeds tailored to children’s gardens, aiming their sales pitch at parents and schoolteachers. The school gardening movement joined the war effort during World War I (1914–1918) when the Federal Bureau of Education introduced the United States School Garden Army. 2.5 million children were enrolled in the School Garden Army in 1919, producing food valued at 48 million dollars at the time. School-based community gardens increased in number in the 1970s, energized by concerns about the environment and urban revitalization. Students absorbed science while enjoying the outdoors and discovering the flavor of fresh-picked veggies. Today, educators and civic leaders have again taken up school gardening. Restaurateur and activist Alice Waters founded the first Edible Schoolyard at Martin Luther King Jr. Middle School in Berkeley, California, in 1995. Her aim was to involve students in all aspects of growing, preparing, and eating food. Edible Schoolyard affiliates have been established across the country, including the D.C. School Garden Program. In 2009, First Lady Michelle Obama oversaw the creation of a vegetable garden on the South Lawn of the White House to raise national awareness of the childhood obesity epidemic. The First Lady’s “Let’s Move” project encouraged students and teachers across the country to use school gardens to promote physical activity and healthy food choices.